1. French toast – David’s challah French toast is hands down my fave, however Corner Bakery is good too. 4. Fried shrimp – my family is from Corpus Christi – you can’t get much fresher than that although S&D Oyster Company in Dallas is awfully yum (runner up: Cheddar’s, no kidding). 5. Cobbler – Salt Lick BBQ in Austin makes a great cobbler but this recipe is a fierce competitor. Do you have others to add? Email me your favorites and I will add them to the list! Linda served this cobbler at a dinner party a few years ago and I have been harassing the poor woman for this recipe for almost that long. This dish really highlights the fruit and the crust is merely an accompaniment. Other recipes tend to be real crusty with a hint of fruit. As blackberries make their way into season, swap out fresh for frozen and top it with your favorite vanilla ice cream. Hello summer! In an 8x8 pan, pour in the blackberries and sprinkle the lemon juice on top. In a separate bowl, combine the egg, flour and sugar until it resembles a course meal. Sprinkle the flour mixture on top. Pour the melted butter on top. Bake for 40 minutes or until golden brown on top. Let sit for 10 minutes. Scoop it out and serve in individual ramekins (apparently you could bake in the ramekins as well). Top with ice cream or whipped cream, if you like. When you hear “picnic” and “side dish,” what comes to mind? Potato salad. Try again. Cole slaw. There you go! Best part about this version is that there is no mayonnaise – not just because some of you are mayo averse but because the outdoor temps won’t wreak havoc with your food and subsequently your stomach. Try this on top of your pulled pork sandwich or as a stand alone side dish. It’s certain to please! Ever wonder where the term "coleslaw" came from? The Dutch called it koolslalade which means cabbage salad. In a saucepan over medium heat, combine ingredients; bring to a boil. Simmer, stirring, until sugar is dissolved; Let cool completely. Toss with finely shredded cabbage. To shred, either do it by hand (and a knife) or if you like a finer, smaller cut (almost mincelike), use your food processor. Cover; refigerate until cold, tossing occasionally, at least 2 hours. Can be made a 1 day in advance. Cover; keep refigerated. "Jesus has a cell phone," Wynne (age 4) proclaims. "How do you know?" her mom asks. "Because at the funeral, the minister said that Mr. X was called to Jesus." I hope Jesus has a good cell plan because he has been busy. The latest casualty is GCB and I am in mourning. Now what am I going to watch on Sunday nights? If the spirit moves you, you can sign the petition to ABC Entertainment. On the episode "Adam & Eve's Rib," the members of Hillside Park Memorial Church compete in a Dallas Interfaith Barbecue Invitational. The men's team, Braise the Lord, competes against the women's team, Spicy Racks, and other teams, including one from a synagogue, "although there is no way they can win a barbecue competition without pork." Those writers from California did not conduct their research. Everyone else knows that Texas barbecue is all about beef. It is North Carolina which believes that it is all about pork. Perhaps that's why the show was cancelled - gross negligence of the facts! Beef or pork, love thy neighboring state's cooking. As we head into Memorial Day weekend, here is a NC BBQ recipe that will allow you to have fun with family and friends and guarantee a tasty meal for all (with minimal effort on the cook’s part - amen to that!). Come back on Tuesday for coleslaw and Thursday for blackberry cobbler recipes. In a medium saucepan, combine the vinegar, red pepper, garlic, and salt (and TX Pete) over high heat. Bring to a boil and then reduce the heat to medium-high. Boil for 15 to 20 minutes and then remove from the heat. Let cool then add the black pepper. The meat can be cooked in the oven or in the crock pot/slow cooker. For oven: preheat the oven to 225 degrees. For crock pot: use the 8 hour setting. 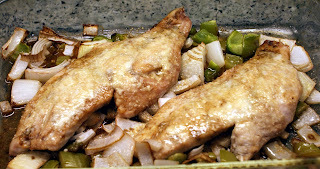 Place the pork and the cooled apple cider vinegar sauce in a roasting pan or in the crock pot . Cook the pork in the oven for 6 to 8 hours or on the 8 hour setting for the crock pot or until the meat is tender and falls apart when the bone is removed. Chop the pork coarsely and mix in salt and barbecue sauce, to taste. Serve with more barbecue sauce on the side. Other sandwich toppings to consider include pickles, cole slaw, and raw sliced onions. 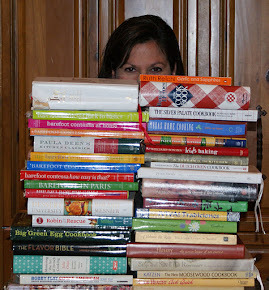 Thanks Susan B. for another winning recipe! End of year means teacher gifts. 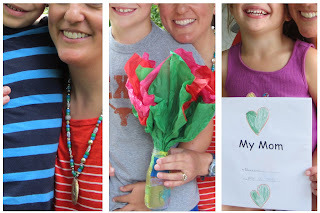 Our school has strict gift guidelines “Gifts which are initiated and made by the students themselves are particularly meaningful... children are encouraged to express their appreciation through … homemade gifts.” Well here is an idea for you! My nephew, Kyle, made these for a school project for teacher appreciation week. This apple does not fall far from the tree. Kyle’s dad is the Culinary R&D Chef at Maggiano’s and his mom is a talented baker who has not caved to my pleas to open a bakery. Perhaps we can convince both of them to submit a recipe too! 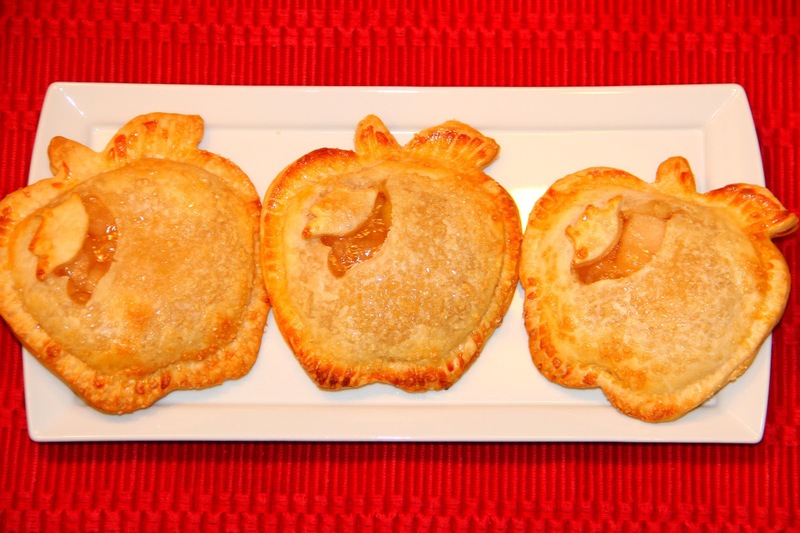 End your teacher’s year on a sweet note with these yummy apple pies! I am in awe of teachers and respect their dedication and passion to our kids. I wish that I had a job in which I impacted so many lives. There have been many special teachers in my life. To all teachers out there, THANK YOU! Pie crust from scratch: In the bowl of an electric mixer fitted with the flat beater, beat together the flour, salt and the 2 tablespoons sugar on low speed until combined, about 10 seconds. Add the butter and beat for 30 seconds, then increase the speed to medium-low and beat until the mixture resembles coarse meal, about 1 ½ minutes more. Add the 6 tablespoons ice water, reduce the speed to low and beat for 20 seconds. The dough should hold together when squeezed with your fingers but should not be sticky. If is is crumbly, add more water, 1 teaspoon at a time, beating for 5 seconds after each addition. Turn the dough out onto a work surface. Divide the dough in half, wrap in plastic wrap and shape into a disc. Refrigerate for at least 2 hours or up to overnight. In a large bowl, stir together the apples, brown sugar, vanilla, cinnamon, salt, nutmeg and cornstarch. In a large sauce pan over medium heat, melt the butter. Add the apple mixture, cover and cook, stirring occasionally until the apples are just tender but not mushy, 16 to 18 minutes (mine took about 10 minutes – it will depend on the size of your apple pieces). Remove from the heat, stir in the lemon juice and let cool for 30 minutes. Let dough stand at room temperature for 5 minutes. On a floured surface, roll dough out into a round 3/16 inch thick. Brush off excess flour. Using an apple pocket pie mold, cut out 8 of each shape (4 solid and 4 with the decorative cutout). Reroll the dough scraps, if necessary, and cut out more shapes. Repeat with the remaining dough disc. Place a solid dough shape in the bottom half of the cutter and gently press the dough into the mold. 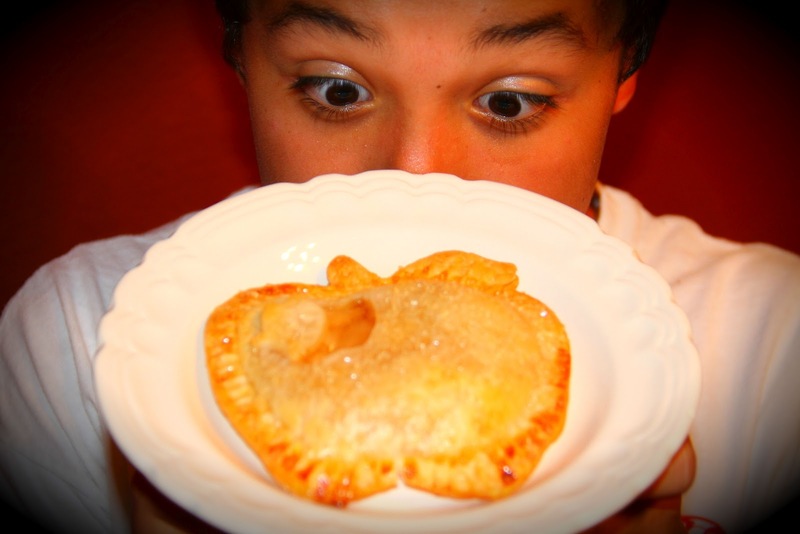 (I did not have a cute apple pocket pie mold so I used a cookie cutter or cup about 3 ½ inches in diameter instead). Fill the center with 2 tablespoons of the apple filling and brush the edges of the dough with some of the egg wash. Top with a shape with a decorative cutout. Press the top half of the cutter down to seal and crimp the edges of the pie. Remove the pie from the mold and place on a parchment-lined baking sheet. Repeat with the remaining dough and filling. Freeze the pies for 30 minutes. Brush the top of the pies with egg wash and sprinkle with the crystallized sugar. Bake until the crust is golden brown and the filling is gently bubbling, 22 to 24 minutes. Transfer the pies to a wire rack and let cool for 10 minutes before serving. Or serve warm with a scoop of vanilla ice cream! Makes 6 - 8 pocket pies. The emails are flooding in. To set the record straight, we are not related to Chris Mann, finalist for The Voice and trained opera singer. We do have an opera star in our family, though, and while my sister-in-law, Jen, is not performing, you can see some of her work during the Fort Worth Opera festival. The festival is an annual affair, features a rotation of 4 different operas, and is occurring now through June 3. I might just head over to see Figaro and the Barihunk (baritone + hunk), Donovan Singletary. Ain’t no fat lady singin’ there. However, if I keep eating these Oreo fudge bars, there might be a larger lady in my house who does not sing all that well. This recipe is a signature dish of Jen and Michael. David runs the other way when they make it. It is that good, even for the ever-healthy David. He cannot resist the temptation and it is comical to catch him with his hand in the cookie jar. The temptation is kind of like the Count towards Susanna who is really Figaro’s bride-to-be. Go see the opera – you’ll understand. Line a 9x13 pan with foil and lightly spray with Pam. Set aside 6 Oreo cookies for the topping and coarsely chop into chunks. In a food processor, grind the rest of the cookies or place in a zippered bag and crush with a rolling pin or meat tenderizer until the cookies are fine crumbs. Add 1 ½ t salt to the crumb mixture and stir. Melt the butter and stir with the cookie crumb mixture until moistened. Press firmly into the bottom of the pan creating a solid crust – meaning, no holes to allow the melted chocolate topping to seep through. Over a double boiler or in the microwave, melt ¾ C semi-sweet and ½ C milk chocolate chips with the condensed milk and vanilla. Be careful not to burn the chocolate – if microwaving, cook (like 30 seconds at a time) then stir, repeatedly, until completely melted. Spread evenly over the cookie crust. Sprinkle the mini or regular (ingredient #8) chocolate chips and the Oreo chunks on top of the melted chocolate and press down gently. Bake for 20-22 minutes. Allow to cool on the counter for 1 hour. Drizzle with melted white chocolate chips (you can melt the chips, then place melted chocolate in a zippered bag, snip a corner and drizzle). Chill in the refrigerator until completely cold and set. Cut into bars. These are best when firm. The more they melt, the more gooey the become and it’s harder to cut and eat. I woke to the pitter patter of Travis placing my Mother’s Day gift on the bedside table. Luckily I was able to fall back asleep because I had not planned on waking at 6:45am. On the gift bag he had turned my name into an acronym and “e” was for “enjoyable”. Good thing that there is not a “t” – perhaps the word chosen would have been “tolerable”. The kids showered me with jewelry, flowers and a book. David made his famous challah french toast. I think he got the hint with the loaf of challah placed near his coffee maker. My friend Pilar has a great perspective on life and rolls with the punches. She expects that she will encounter some stupidity every day and when she does, she simply looks at the person and says “thank you.” Today my thank you goes to the people in the car from CO who backed into us at the Arboretum with a Dallas police officer as our witness, never mind us honking the horn continuously for multiple seconds. The driver and passenger then proceed to yell at us that it was the cop’s fault for telling him to back up (and to not use his rearview mirror while doing so - ha! ), that he wants our insurance information and that he has our license plate number. Ok, we’ll get right on that. We did make it to see the Chihuly today. It was truly amazing and beautiful but I really want to know how they ship these pieces without breaking! The exhibit is in Dallas through November 5 so you should plan a visit. I'll go back with you! Mix together ingredients #2-4. Dip the sliced bread into the egg mixture to coat and saturate but not to the point of the bread falling apart. Place in a buttered skillet until brown. Flip and cook the other side. Serve with jam, syrup or dusted with powdered sugar. As you probably know, this Sunday is the day you cannot play golf Mother’s Day. Please don’t misunderstand this letter. It is not that I am unappreciative of last year’s Mother’s Day when you took “me” to watch the Rangers play the Yankees. After all, you did treat me to a Lemon Chill which dulled the pain from the sunburn. I enjoyed the barbacoa tacos at the gas station for my birthday and the iPad for my 40th although you and the kids never let me use it. Given that, I wanted to tell you exactly what I want to do make your lives easy. I love lobster so I have provided a recipe below for lobster rolls. It’s kind of like being in the Hamptons without the scene and the traffic. How about I we pack a picnic and go to the Arboretum to see the Chihuly? We even have a family membership. How clever of me you! Cut the cooked lobster or shrimp into 1/3 inch pieces or use lump crab meat. Stir together your selected dressing. There are 2 dressing options: with mayonnaise is more traditional, however for the mayo averse husband and friends, there is a dressing made with Greek yogurt. Carefully fold in the meat and season to taste with salt and pepper. Open the hot dog buns and brush the inside with olive oil or butter. Heat a grill pan over moderately high heat and grill the bread, cut side down, until toasted, about 3 minutes. Fill each with 3/4 cup of the lobster mixture and serve immediately. Spoiler Alert: swimsuit season is approximately 18 days away. My poor exercise and eating habits are about to be on display. Explain to me: why do guys get to wear long shorts, and if they are feeling paunchy, a swim shirt (all in the name of sun safety)? I know there is some correlation as to why men don’t wear Speedos any more. Even Michael Phelps is wearing long swim shorts – otherwise known as Spanx for Men. So with the countdown ringing in my ear, I tried this lentil salad provided by my childhood friend, Wendy N. It is funny how life intersects. I grew up with Wendy, we went our separate ways, and then 15 years later our worlds crossed again in the hospital as we had our second round of kids 1 day apart and that’s also when we realized that our husbands grew up together too. Small (although my gut is not) world. If you like lentil soup, this is a great, summer temperature alternative. This recipe makes a lot so try cutting it in half and finding something else to do with the remaining red pepper and red onion. Of course you can adjust the various add-ins to the amount and flavor that you like. Rinse lentils. Place in pot with enough water to cover (lentils will expand as they cook). Bring to a boil and simmer until lentils are cooked, adding water if necessary to keep lentils covered (approximately 20 minutes). Drain lentils, place into a mixing bowl and allow to cool to room temperature. Add onion, parsley and red pepper. Pour on the French Vinaigrette dressing. Stir and serve. Delicious at room temperature or cold. Can be made and ahead and stored in the refrigerator for up to 3 days. Paula Deen, a charming Southern gal, has received some negative press lately. Yes, she cooks with a lot of butter, cream and sugar and we have explored the devilish side of her recipes (French Toast Casserole; Hash Brown Quiche). But this is fish so let's cut her some slack. What better way to end our Mexican food journey than with a margarita! Like the guacamole, I wanted to learn what comprises the basic margarita: lime, tequila, orange liqueur and ice. You can get fancy and add flavorings like watermelon, orange, mango, pomegranate, jalapeno… The primary decision is on the rocks or frozen. I like mine frozen – an adult version of the Slurpee. You can experiment with the decor such as adding salt to the rim or colored sugar. As you experiment, each one will get more interesting, especially as the night goes on. I served this Barefoot Contessa frozen margaritas at a school end of year celebration. Let's just say we had some happy volunteers and it was a good thing that they were not driving carpool until the next morning. As you celebrate Cinco de Mayo, also raise your glass to everyone riding the MS150 this weekend. Many friends ride on the Feisty Devils Cycling Team. They and thousands of others train, ride and raise money to fund research to treat and eventually cure Multiple Sclerosis (MS) and to provide services for those with MS.
MS is a progressive neurological disorder that affects people in many different ways. It could be paralysis one day, loss of vision the next or impaired memory the day after that. Living with MS means living with uncertainty. Another American is newly diagnosed every hour of every day. To learn more about the Feisty Devils or to donate to their team, please visit the Feisty Devils web page. If you like margaritas served in a glass with salt, rub the outside rims of 6 glasses with a cut lime and dip each glass lightly into a plate of kosher salt. Combine the lime juice, lemon juice, Triple Sec, tequila, and ice in a blender and puree. Place extra ice in a cocktail shaker. Fill with margarita mix, shake well, and strain into glasses. Notes: Recipes vary in proportions of tequila: orange liqueuer : lime juice including 1:1:1/2, 1:1/2:1/3, and 1:1/4:3/4 so mix based on the flavor that you want to achieve. What is consistent is the recommendation to purchase a good tequila, in particular one that is 100% agave. There are other variations to choose from based on the age of the tequila: silver/blanco/white tequilas are unaged, then there is reposado and anejo (aged). Most recipes I found called for silver/white/blanco. And for the last component, you can select the orange liqueur from brands like Triple Sec, Cointreau and Gran Torres. Does your life these days seem busier than usual? In addition to the regular homework, practices, games and lessons, there seems to be lots of end of year projects, celebrations, festivals, recitals, receptions, send-offs, thank you luncheons; not to mention me wanting to cram in coffees and lunches with friends before summer too. Time to cook is more limited than before. My friend Alyssa shared her chicken tacos recipe. Yes, I am venturing into the crock pot world again. Place all the ingredients in the pot and 6-8 unattended hours later… Besides that benefit, she says that there will be enough to make chicken enchiladas later in the week! Now that’s a good use of my time! Place chicken in crockpot. Season both sides of chicken with taco seasoning (the original recipe calls for the whole packet, but it's salty that way so I used about ½ the packet). Pour salsa over the chicken. Add drained and rinsed beans. Add drained can of corn. Stir. Cook on low 6-8 hours (usually it’s 6 ½ - 7 hours but it will depend on your crockpot). After cooking, shred the chicken with a fork and mix all together. You won't have to shred too much - just stir with a little bit of force and the chicken shreds for you. Spoon into tortillas. Add your preferred toppings and enjoy!